Preventative Dentistry at Jepsen-Murphy and Associates includes routine dental care to keep our patients’ teeth healthy. By brushing and flossing regularly, and through annual dental exams, checkups and cleanings, we’ll help you keep up your oral hygiene. Visit us for deep cleaning, flouride treatments, oral cancer screening, comprehensive exams, and digital X-rays to detect cavities and other underlying infections. The American Dental Association recommends regular cleanings and a routine checkup at least once a year to keep your mouth and teeth healthy. Plaque and tartar build-up on the teeth can cause oral diseases and promote the growth of bacteria, a contributor of bad breath. In addition to removing plaque and tartar build-up, your dental physician will check for signs of gum disease, oral cancer, and make sure you leave the office with polished, healthy-looking teeth. Deep cleaning for gum disease is when plaque and tartar is scraped away above and below the gum line to keep the tooth smooth and bacteria-free. 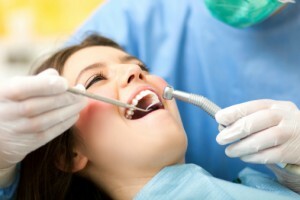 Deep cleaning is instrumental in keeping the most serious side effects of gum disease away. Flouride is a naturally occurring mineral that can be found in both soil and water, but is also used in toothpastes and mouth rinses to prevent tooth decay. In the dentist’s office a higher concentration of flouride can be applied to the teeth or even prescribed. -At Jepsen-Murphy and Associates, we offer our patients comprehensive dental exams, which allows your dentist to give you a thorough checkup and teeth cleaning. During this exam, you can expect an oral tissue examination, oral cancer screening, periodontal evaluation, a temporomandibular (jaw) joint checkup and more.